Last Day To Get Cyber Monday Deals At Avon/mark. Today is the last day of the Cyber Monday deal at http://www.youravon.com/aliciahessinger You have until midnight to take advantage of these extra savings! Shop amazing offers online — use offer code CYBERMON! And spend $65 or more get 25% discount, free shipping, and a FREE A BOX! He’s making a list and checking it twice… Time to make your shopping lists and get names checked off! Let me help you with that. 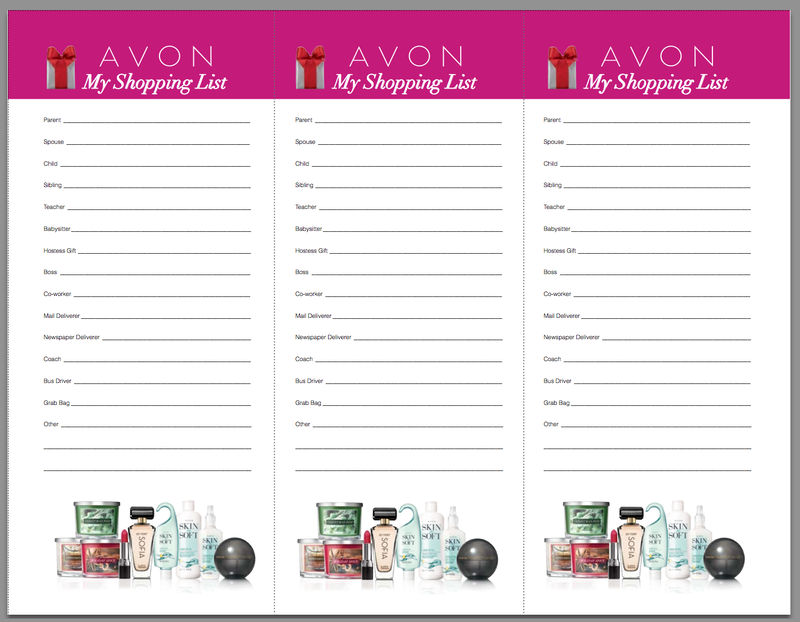 First, to organize your shopping here’s a holiday shopping list printable so you can write out who and what you need to get. Once you have that figured out might as well get your list tackled over at my eBoutique. Not only will you find something for everyone on that list but you will also get FREE shipping, 20% off today and a bonus 8 piece gift set that you can keep for yourself as an appreciation for your hard work online shopping OR use as a stocking stuffer or girlfriend gift. Not sure what to get? Check out the gift guide! Either way there’s TONS of great stuff at Avon this year, especially in the Avon Living section! You can’t go wrong with a triple wick candle as a gift! Today’s Cyber Monday deal is definitely the best all week but we have exclusive offers coming for the next 12 days… 12 days of deals if you will so be sure to check back and see what tickles your shopping list fancy! It’s a rough Monday back, I’m not going to lie. The only thing making it better are these Cyber Monday deals! Today and tomorrow at my eBoutique you can get 20% off a $40 order and if you bump that up to $65 order you get a FREE tote full of the best of the best from Avon. Here are my top picks for your Cyber Monday Shopping! Stocking might be my favorite gifts to buy for! Something with impact that fits in a stocking is a task! Winners are always, jewelry, beauty and bath and body! A huge trend this year are jacket earrings, pick up the mark. Jacket Required Earrings in a go with everything black and gold. For beauty I love a good eye pallet, mark. On The Dot is perfect in stocking size and mega impact! New this year is our matte pallet but neutral is always the best seller! For bath and body I love the luxe online exclusive Avon Planet Spa, try slipping in a facial mask for the winter skin or a rich body cream! mark. brought back just in time for the holiday the best selling mark. Naked Love! mark. On The Dot Eye Palette in matte. My favorite little gift idea is pairing a hand cream and a nail polish together. Tie them together with a pretty ribbon and add a tag that reads “for your mistle toes!” The Avon holiday hand creams are 2 for 1.75 pair it with the Avon polish or the mark. Nailed It Duos! The mark. Sparkle Collection is holiday perfection! If anyone gave me this under my tree I’d be smiling ear to ear! You can go big and gift the whole collection or piece it out. Pair the fragrance lotion and soap or the eye pallet and brush set! Guys are always hard to shop for which is why I love gifting cologne. Something they want but rarely go out and buy it for themselves. My favorite from Avon is the Luck for him but the new Attraction is popular scent (3 piece set for $30) or pick up one of the other collection sets like Black Suede ($9.99 an oldie but a goodie) or Avon Instinct ($16.99). Those bundle prices are unreal for men’s cologne! There are so many cute hostess gift ideas from the new collection, Avon Living that was introduced this season. What I’m loving are the stemless wine glasses and cocktail wine plates that fit right over your glass. These two are bundled together for only $30! Such a cute and unique idea that they’ll actually use! The mark. Sequins Of Events Dress is a MUST HAVE for holiday! It will get you through all your parties, Christmas and New Years! Pair it with a cozy sweater to be more casual, a blazer to dress it up or with a killer heel for NYE! With the cyber deal it comes to $35 which for a sequin dress is a great price! Pretty much the entire mark. Buenos Aires collection is on sale so partnered with the 20% it’s the best savings! I’ve showcased my love for this collection and would be an awesome gift for anyone planning a winter trip but the top picks are the mark. Fade To Fab clutch and the mark. Hang Of Things Body Chain. Check out the Buenos Aires Collection here, here, here and here. You can shop these deals at http://www.youravon.com/aliciahessinger not only are you shopping with a friend you are personally supporting me which I appreciate beyond words! Use promo code CYBER2015 for your 20% off $40 and FREE tote at a $65 order!